Plays and performances at all finest theatres in London, show tickets, listings and reviews. Big shows in London theatres tonight. London has a range of theatres to see everything from popular musicals and shows to edgy new plays to classic drama. 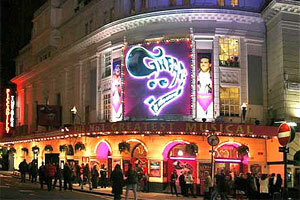 London’s West End has over 40 theatres and rivals New York’s Broadway as the theatre-going capital of the world. Fringe theatre is also well-represented with a range of venues from small theatres to rooms over a pub. Visitors should head for the Society of London Theatre ticket shop for cheap tickets to London shows. The National Theatre stages over 20 theatre productions a year in the three auditoriums: the Olivier, Lyttelton and Cottesloe theatres. It presents a mix of new plays and classics, with up to six productions in repertory at any one time. There are also short early-evening platform events, including talks and conversations and free live music before performances. The Globe theatre reconstruction opened for performances in 1997, it holds workshops, lectures and staged readings and productions designed to showcase Shakespeare’s work. Theatre Royal Haymarket offers the traditional theatre-going experience. It focuses on drama and hosts an interesting programme of classic and new plays. The theatre was designed and constructed in 1720 and its interior is one of the most lavish in London. The Old Vic is one of the best-known theatres in London and some of the greatest British acting talent has trodden its boards from Laurence Olivier to Judi Dench. The artistic leadership of Kevin Spaceyhas given it a new lease of life and the 192-year-old building continues to host great performances. The Royal Court Theatre is dedicated to new work by innovative writers from the UK and around the world. It has a key role in promoting new voices and presents an ambitious programme of new plays its two venues in Sloane Square. The Alchemic Order opens the third and ongoing season of their original adaptation of Oscar Wilde's The Picture of Dorian Gray: A Restoration. The audience, as guests at Dorian Gray's Georgian town house, experience the story as it unfolds around them, in a manner akin to the Victorian salons of the 19th Century. It is a completely unique production on many levels and is exactly the kind of night out that London theatre goers and visitors and tourists seek. For the last couple of seasons the production has been something of a 'well-kept secret', with the majority of guests finding out through word-of-mouth. Tags: theatre and london, theatre tickets london, theatre plays london, theatres london, theatre breaks london, theatre in the west end, drama theatre london, london theatre tickets cheap, theatre shows london, what theatre shows are on in london, globe theatre london, theatre show london, lyceum theatre london. All photographs that appear on this web page are copyright their respective owners and London Where claims no credit for them unless otherwise noted.